Pesaro, July 27th - aVOID, the tiny house prototype created by the young Italian architect Leonardo Di Chiara will be exhibited for the first time at Piazzale Collenuccio from 10.00 a.m. to 11.30 p.m. before leaving for a journey through Europe, starting from Italy and Germany, to then reach the Bauhaus Campus exhibition in Berlin. The mobile house on wheels is part of the artistic, architectural and scientific research project “aVOID- Tinyhouse University Headquarters”. Being commonly referred to as the tiny house by the movement that invented this typology of houses in the 1970s, the prototype reflects on the theme of dwelling in minimal spaces. 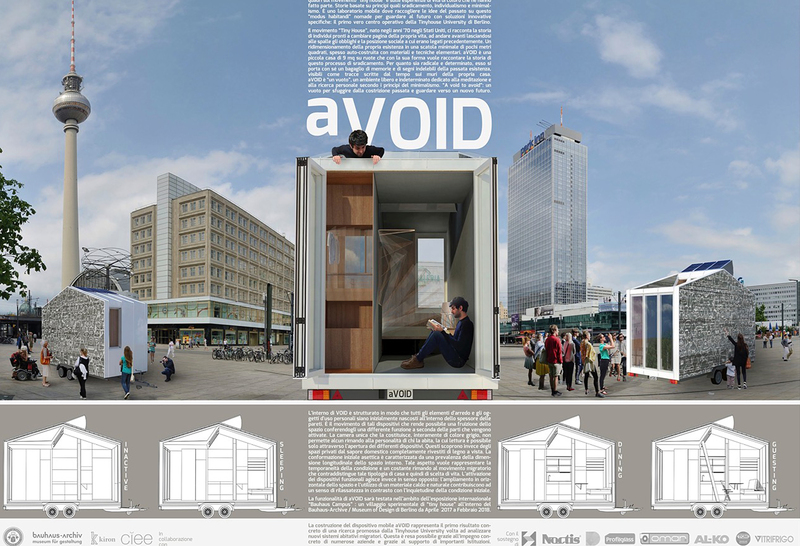 aVOID, a prototype part of the activities promoted by the non-profit Tinyhouse University, is the first of twenty mobile houses that will make up the temporary village set up for the Bauhaus Campus International Exhibition at the Bauhaus Archive (German: Bauhaus-Archiv) Museum of Design, in Berlin, from May 2017 to March 2018. The village aims to incite the debate on topics of social interest such as sustainability, urban space, integration, etc. The results achieved during this research period will constitute the basis for a staged revealing process which will be independently promoted by individual homes from the end of the Campus. iGuzzini supported the initiative by providing the young architect with an interior lighting system that reinterprets the minimalist concept and the attention to detail. In line with the fact that personal belongings are hidden in the thickness of the walls, the lighting seems to come from an invisible source thanks to the Laser Blade and Laser fittings which generate homogeneous, warm, and highly comfortable general lighting. Moreover, the Front Light projectors installed into the structure via a recessed track, ensure that the orientation of the luminous flux can be adjusted, thus avoiding problems of maintenance and transport which could arise if exterior projectors were used. Nine square metres, inspired by the Less is More concept, where the minimal interior design goes hand in hand with the light emanating from the architecture itself - this is aVOID Tiny House. Products used: Laser, Laser Blade High Contrast, Front Light.